Surprise! 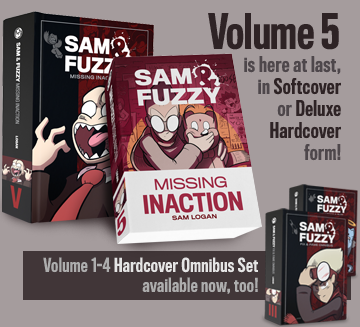 The Sam and Fuzzy Are Very Famous book collection is available to buy RIGHT NOW, slightly ahead of schedule! And man, if you're a fan of the strip, I heartily encourage you to pick on up, either online or at San Diego Comic-Con. They're gigantic (400 pages! ), they're gorgeous, and they put food on my table and pens in my hand. Plus, if they do well, we can make even more books and eventually collect the entire archive... my greatest dream! Once again, we'll be doing a full year of extra Book Club bonus goodies for everyone who picks up a copy of the book. In fact, the first bonus comes right with the book itself! If you order now, a free Fig Pig is on a Bookmark bookmark will be included with your copy. I had a lot of fun designing a real Fig Pig paper product in the style of SanPresto's endless Fig Pig product line. But it's not just new books in our Topatoco store! We also have a brand new t-shirt... Tanuki Plumber! Sometimes, an idea just comes to you in the middle of the night, and you have to make it a reality. This shirt is one of those things. I'm super excited by how it turned out. 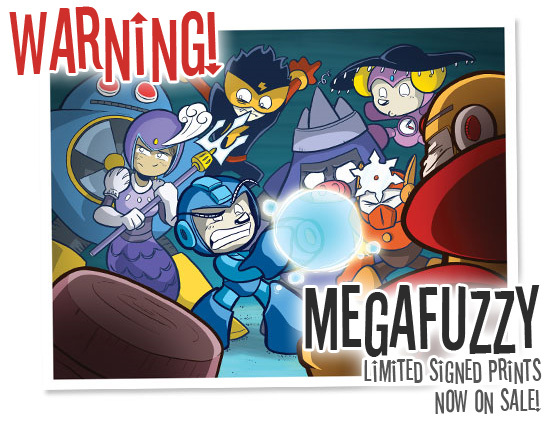 And like the new book, we'll have these at San Diego Comic-Con, too! In conclusion... new stuff! I hope you all dig it. 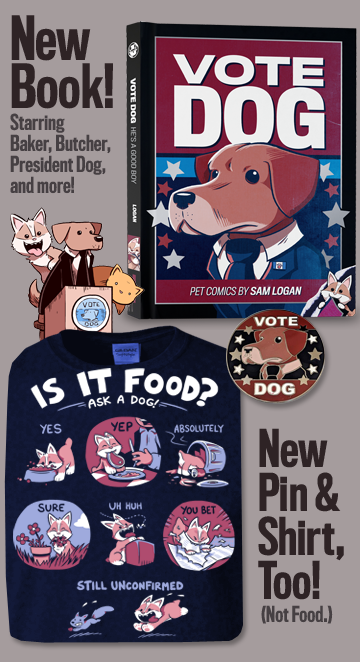 And if you do, anything you could do to help spread the word to other folks who like comics and goofy gamer tshirts would be majorly appreciated. Yes, believe it or not, there might actually be a couple honest-to-goodness one page comics in this volume! You could say I put them there because I was trying to balance out all the extra three and four pagers. Except there are a lot more of those. And a lot less of these. So basically, you'd be saying I was a failure. And you'd never say something that mean about me, would you? Truth be told, I just try to chop up these stories into the chunks that make the most sense. Sometimes that means going over, and sometimes that means going under. And sometimes it means going completely crazy. Which I'm good at! San Diego Comic-con is only a week away! As always, I am psyched and terrified. But mostly psyched, because I'm going to have some exciting new items to debut at the show! (And online too, of course.) Anticipate! I'm back! Of course, you may not have even realized I went anywhere, but rest assured: I was away this weekend. 15 hours of solid driving away, to be precise, at a friend's wedding (which was lovely). Now to be fair, that's still not as much driving as our the infamous "accidental" San Diego road trip of 2010, but even so... I am pretty exhausted! It's a good thing I drew today's comic in advance. Because right now, I'm not sure I could even remember how many corners to put on a square. Proper brain function returns Wednesday. See you then!